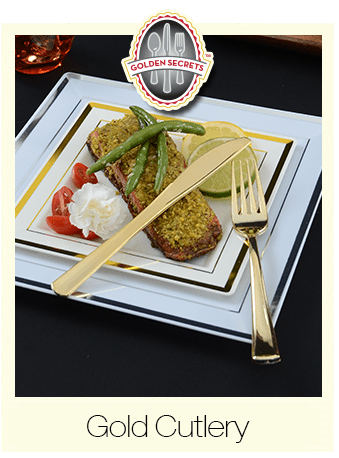 Gold Secrets Plastic Cutlery CHECK OUT THIS DEAL!! The Gold Secret Collection - Disposable Metallic Gold Plastic Cutlery Disposable Flatware Combo is heavy duty and durable enough, you will want to wash and reuse them. Hand washing is recommended. Great for elegant events, corporate events, holiday and family parties and Everyday Meals Our disposable flatware is durable and doesn't break easily, it provides the sophisticate look of a formal setting without having tons of dishes to wash away. GOLD SECRETS!! LOOKS LIKE REAL!! Gold Plastic Forks 24ct. GOLD SECRETS!! LOOKS LIKE REAL!! Gold Plastic Spoons 24ct. GOLD SECRETS!! LOOKS LIKE REAL!! Gold Plastic Knives 24ct.